Earlier today in an event attended by German Chancellor Angela Merkel (herself a PhD physicist), researchers from the Max Planck Institute in Greifswald turned on the Wendelstein 7-X stellarator, an experimental nuclear fusion reactor. (Actually, the researchers let Merkel do the honours). 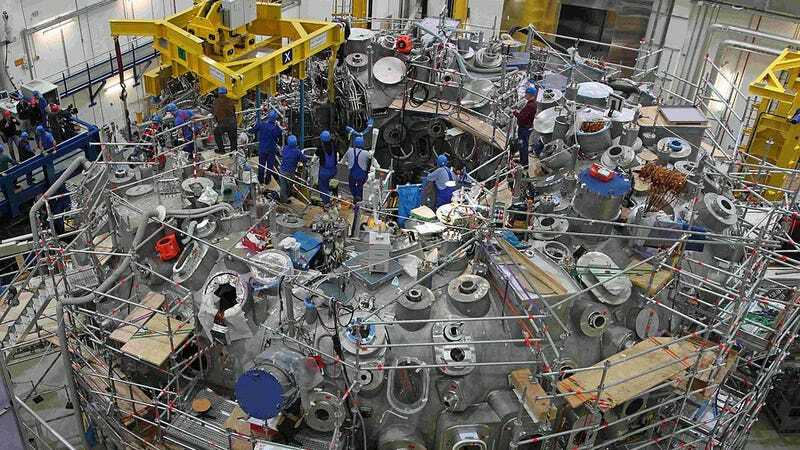 This €400 million stellarator is being used by physicists to test the technical viability of a future fusion reactor. Unlike nuclear fission in which the nucleus of an atom is split into smaller parts, nuclear fusion creates a single heavy nucleus from two lighter nuclei. The resulting change in mass produces a massive amount of energy that physicists believe can be harnessed into a viable source of clean energy. Back in December, the same team of researchers fired up the doughnut-shaped device for the first time, heating a tiny amount of helium. During today’s experiment, a 2-megawatt pulse of microwave was used to heat the hydrogen gas and convert it into an extremely low density hydrogen plasma. “With a temperature of 80 million degrees and a lifetime of a quarter of a second, the device’s first hydrogen plasma has completely lived up to our expectations,” said physicist Hans-Stephan Bosch in a press statement. W7-X isn’t expected to produce any energy, but it will be used to test many of the extreme conditions that future devices will be subjected to in order to generate power. Temperatures within the device could conceivably reach 100,000,000°C.